Brenda is 3rd. from the right in row 3. Hi again, Peter! Looks very much like the exterior of St Luke’s School. The herringbone pattern of the bricks above the windows is a giveaway. Thank you once again Janet, that’s great. There will be three more pictures to come. Yes, that’s definitely St Luke’s. My wife, Jeannette (nee Clout), is sitting far right as you look at photo in a white dress. Holding the board is Susan Tester who lived opposite her in Hartington Road. Behind Susan, with glasses is Pat Gane. Back right with glasses is David Gillam and two along from him is Brian Hardy. Far left standing is Brenda Freeland and three along from her is Pam Griffiths. That’s all the names she can recall but she does remember Peter’s wife. Interesting the ratio of girls to boys in “A”. Never an A, always a B. What year is this? I was there from about ’64 to ’68, and St Luke’s infants before that. Really excited to see this picture. 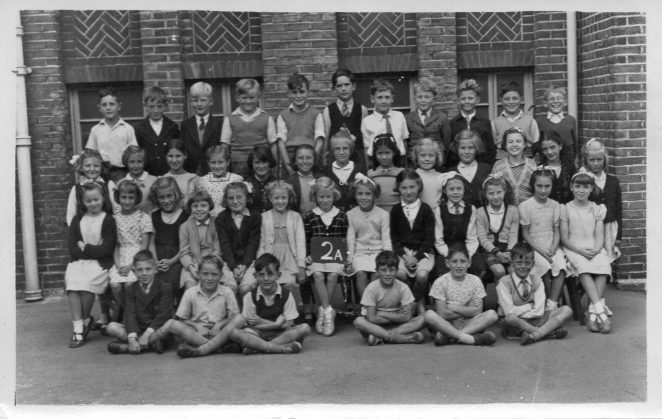 I am remembering all my classmates names, I was Gloria Raynsford, second row down, 5th from right sitting next to Lesley Bignell.